White bird of paradise (Strelitzia nicolai), also known as giant bird of paradise, grows in warm, humid climates and can grow as tall as 30 feet, with huge, flat leaves that resemble paddles arranged in fan. The white bird of paradise blooms, which are often hidden in the upper reaches of the plant, are blue and white. White bird of paradise can be divided to propagate a new plant in late spring or early summer. 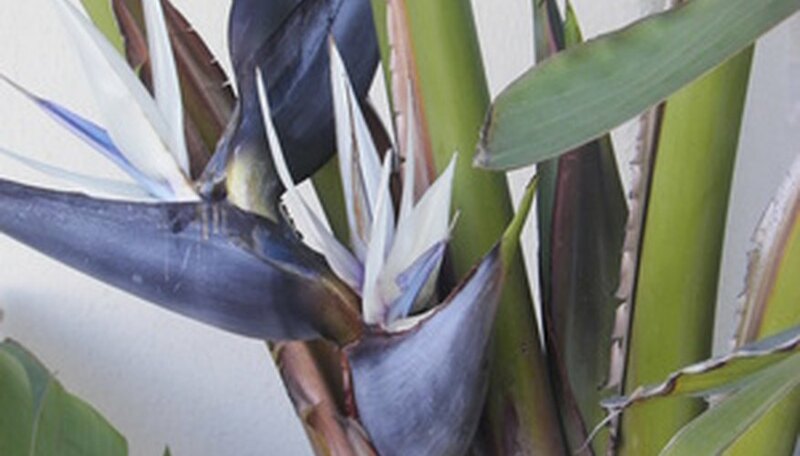 Select and prepare a planting site for the divided white bird of paradise ahead of time. Choose a sunny spot. Although bird of paradise will grow in partial shade, at least six hours of bright sunlight each day will bring out the biggest, brightest blooms. Use a shovel or garden fork to work the soil to a depth of 10 inches. If the soil doesn't drain well, add 4 to 6 inches of peat, compost or manure to the soil. Remove an offshoot growing at the base of the plant. Dig completely around the circumference of the offshoot, then use a shovel or garden fork to lift the offshoot carefully from the ground and away from the mother plant. Rinse the roots with a garden hose to enable you to see the natural divisions. Divide the offshoot into sections, each with four or five stems. You may be able to divide the offshoot with your hands, or use a sharp knife or a trowel. Water the offshoot deeply, and keep the soil moist. A 2-inch layer of organic mulch around the plant will retain moisture, enrich the soil and deter weeds.